Bank of Baroda SO Recruitment 2018 | The official notification for Bank of Baroda Specialist Officer recruitment has been released. Bank of Baroda SO (specialist officer) recruitment exam is conducted annually by Institute of Banking Personnel Selection (IBPS) to screen eligible candidates into various vacancies of BOB. Aspiring candidates can apply between Dec 05, 2018 and Dec 26, 2018, on the official website of IBPS @ibpsonline.ibps.in/bobsplnov18. A total of 913 vacancies have been announced this year for the Bank of Baroda SO recruitment. Eligible candidates can apply for this exam on or after Dec 05, 2018 but we advise the aspirants to not wait until the last date to fill the application form. The test will be conducted in the online mode for a time duration of 2 hours and the exam paper will be available in both English and Hindi languages. The exam date has not been announced yet. As soon the official dates get released, we will put the information here. The Bank of Baroda SO Recruitment Exam will screen candidates into various positions of Scale 1, Scale 2, and Scale- 3. Main departments for which SOs will be recruited are Legal, Wealth Management Services- Sales, and Wealth Management Services- Operations. 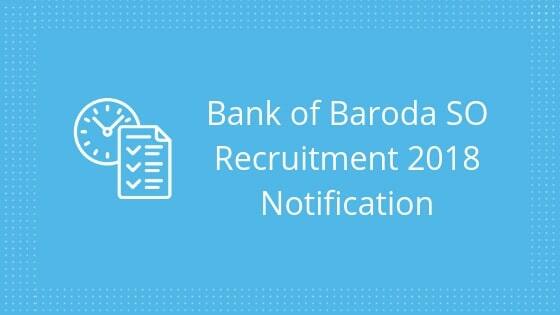 In this article, we have included all required information related to Bank of Baroda SO Recruitment notification. Kindly, read the article to find the information you need. Let us now look at the detailed information on the eligibility criteria based on different posts from the table below. Wealth Management Services (Sales) MMG/ SII 2 year (MBA or Equivalent) Post Graduation Degree or Diploma in Specialization in Marketing/ Sales/ Retail. Age limit for Bank of Baroda Specialist Officer recruitment is tabulated below. Take a look. IBPS is conducting Bank Of Baroda SO exam to fill its 913 vacancies. These specialist officers will be selected for various departments in various positions under different scales. The eligibility criteria for each post is mentioned above. The detailed information regarding the number of the vacancies and qualification required for each vacancy is tabulated below. Aspiring candidates are required to register themselves for Bank of Baroda SO Recruitment 2018 through online by filling an application form on the Bank of Baroda’s official website. Applications via any other mode will not be acceptable. Forms will be available on the official website @ibpsonline.ibps.in/bobsplnov18. While filling the application form, Candidates must keep certain things in their mind. We advise candidates to double check their details before submitting the registration form. Consider these few tips mentioned below while filling the Bank of Baroda SO Recruitment application form. Candidates can save the data while filling the application if they are unable to fill it in one attempt. Saved application form can only be accessed thrice using provisional registration number and the contact number. Do not upload signatures in Capital letters. Candidates are advised to click on ‘Save’after filling the application form before entering to Next tab. Cross- Check the data before the final submission. Spellings like Name of the candidates/ father’s name/ husband’s name etc. should be filled correctly. Any discrepancies in the spellings mentioned on the form can lead to the rejection of the candidature. Any online application with incomplete data like Passport size photograph/ signature etc. will be rejected straightaway. The contact information you provided while filling the application form such as e-mail address or mobile number must remain active for further communication till the end of the recruitment process. Application for the Bank of Baroda SO recruitment will only be successful after making the payment online. The amount paid for the application fee is non-refundable. The application fee for candidates belonging to different categories is tabulated below along with the acceptable mode of payment. Have a look. Bank of Baroda SO Recruitment procedure will include three stages. If two or more Candidates secure the same cut off marks, candidates with more age will be placed in the better position. Candidate must acquire the minimum marks from each test to be eligible for the PI interview. A) Hard Copy of the interview letter. B) A print out of the online application form generated by the system. D) Semester/ Annual mark sheets and certificates of education including the final degree or diploma certificate. Approved certificates by a board or university with information of result declaration on or before Nov 01, 2018. E) Caste Certificate issued by official authorities. F) Disability Certificate issued by the District Medical Board. G) Service or discharge book for Ex-Servicemen including the proof of pension payment order. H) A NOC for current Government/Quasi-government/ Public Sector employees by their authorities. K) Work Experience Certificates, salary slips, relieving letter, appointment letter (if applicable). There will be a total of 200 questions in the Exam paper. For each right answer, candidates will be rewarded with positive marks. Candidates will get 2 hours to finish the exam. Bank of Baroda SO Recruitment admit card will be available for the candidate to download from the official website https://ibpsonline.ibps.in/bobsplnov18/ once the application process is completed by the candidate. Go to the official website to download the admit card. Click on the tab ‘BOB SO Admit Card’. Candidates will have to use their Username and Password to log in. Download the admit card and keep it safe for further references. Note: It is mandatory to carry the Bank of Baroda SO Recruitment Admit card along with an ID proof to the exam center. Candidates will not be allowed for the exam without the admit card. Bank of Baroda SO Recruitment exam date has not been announced yet so you still got a chance to apply for the exam and prepare well for it. Always make a schedule before starting your practice and follow it constantly. Practicing more often will help you improve your speed and accuracy in the main exam. So, Embibe has created a platform where you can practice and receive analysis after each test at the same time. Click on the link below to practice questions from IBPS PO Bank mock tests. Practice mock tests of BOB as well to get yourself ready for the main exam. Also, we advise you to keep an eye on this page since we update every single detail on the official date once it is released by the exam conducting authority. We hope that the information we have provided on Bank of Baroda SO recruitment 2018 exam was useful for you. If you have any query or feedback to share, please feel free to drop a comment below. Embibe wishes you all the very best for your exam.